Since today is my birthday, I thought I would celebrate with a little cake...a cupcake to be exact. I've seen alot of cute Angry Bird cupcake designs around the web and while mine may not be as cute as some of those, I'm sure they taste MUCH better. If you've been around my blog a little, you may have heard that I don't like fondant...at all. And I don't know many kids who do either. 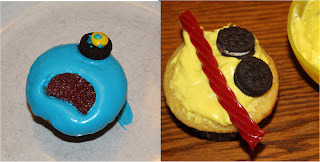 So when I'm trying to come up with fun, theme cupcakes, I try to find a way to make them using real frosting and yummy treats. So when I saw Bacon Time with the Hungry Hypo's cupcake design, I knew I'd found a winner. But they were easy and fun to make. We started by baking a batch of cupcakes. As much as I would LOVE to try some Cherry Limeade cupcakes, I didn't think the kids would be too thrilled with those, so they are a simple, yummy yellow cake. Then we died our frosting red, yellow, and blue. I used little bowls so it would help keep the boys a little more in check. then added M&Ms as pupils using a little extra frosting. I cut the orange slices up to use as a beak and the licorice in pieces and then in half for the eyebrows. We tried using peanut M&Ms for the bird's hair piece, but I liked using the slices better in the end. We had a good time making our Angry Bird cupcakes and in the end we had some fun cupcakes for our party, a good time together, and a few baths!